Poet~tree EnMotion Presents : Fall Harvest Festivities! This ongoing seasonal series features a variety of multi-disciplinary performance, arts & culture presentations… The performance portion for this event begins @ 7pm ish featuring a Dynamic Lineup ranging from Funky Live Musical Acts to Spoken Word Performance Flowetry, from Hip Hop Dance to Fire Flow Artistry! This entry was posted in Uncategorized on August 9, 2017 by plumdragoness. The Fall 2014 Performing Arts Series! 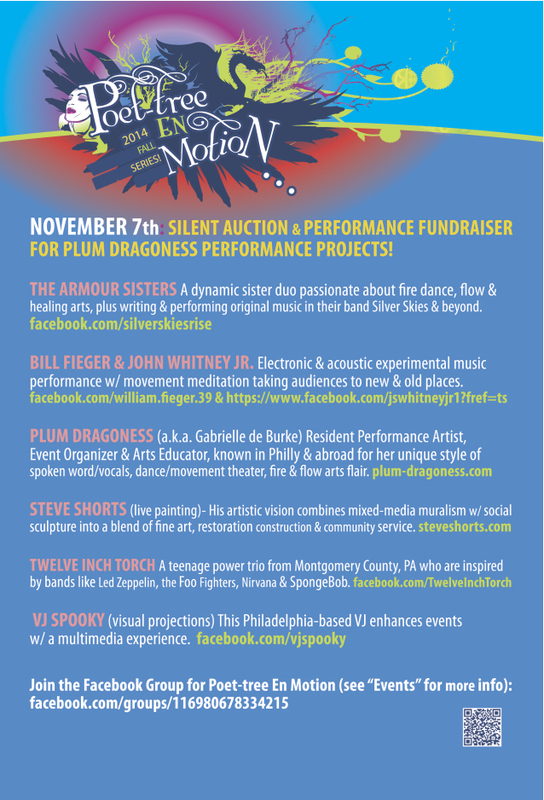 Fundraiser for Plum Dragoness Performance Projects! This ongoing seasonal series features a variety of multi-disciplinary performances & community art. The final Fall 2014 series will culminate with Live Music, Dance & Theatrical Presentations, Community Art, Live Painting, VJ Performance, Plus the Annual Silent Auction Fundraiser for Plum Dragoness Performance Project (Items ranging from Holistic Goods/Services/Body Products, Antiques, Art, Estate Jewelry & etc.)! about fire dance, flow & healing arts, plus writing & performing original music in their band Silver Skies & beyond. • Bill Fieger & John Whitney Jr.- Electronic & acoustic experimental music performance w/ movement meditation taking audiences to new & old places. • Diabolo Dave- a talented entertainer that performs a number of skills for a wide range of audiences w/ “the heart of an educator and the spirit of a performer” & One mans exploration of physics. • Plum Dragoness (a.k.a. Gabrielle de Burke)- Resident Performance Artist, Event Organizer & Arts Educator, known in Philly & abroad for her “unique style” of spoken word/vocals, dance/movement theater, fire & flow arts flair. • Twelve Inch Torch- A teenage power trio from Montgomery County, Pennsylvania who are inspired by bands like Led Zeppelin, the Foo Fighters, Nirvana & SpongeBob. • VJ Spooky (visual projections)- This Philadelphia based VJ enhances events w/ a multimedia experience. This entry was posted in Uncategorized on October 31, 2014 by plumdragoness. This entry was posted in Uncategorized on May 31, 2014 by plumdragoness. Poet-tree En Motion: Spring Rites & The Femme-Mynistiques Fundraiser Night! April 2nd, May 7th & June 4th! April 2nd: Spring Rites & The Femme-Mynistiques Fundraiser Night! This entrancing trio brings together; Plum Dragoness-the lyrical poetess, Lady Omni-the omnipotent emcee & Alexa Gold-the golden voice!!! Together the Femme-mynistiques are a righteous storm creating a innovative niche on the scene with their awe-inspiring original fusion of Lyrical Poetry, Omnipotent Raps & Siren Vocals set to dynamic variety of conscious hip hop, tribal house, down-tempo & electronic music. Performances blend their respective skillfulness in music production, dance choreography, theater arts, poetry as performance and song writing into an illuminating blend of ancient rites that celebrate the modern spirit of freedom, unity and love. May 7th: Spring Fire Lights the Night & Lunar Celebrations! June 4th: Summer Festivities & Plum Dragoness Annual Fundraising Auction! This entry was posted in Uncategorized on March 14, 2014 by plumdragoness. This entry was posted in Uncategorized on February 5, 2014 by plumdragoness. Poet-tree En Motion 2014 Winter & Spring Performance Series! 2014 Winter & Spring Performance Series! Feb 5th, April 2nd & June 4th! Plus an Open Mic/Stage & Jam Sessions! February 5th: Lunar New Year Salutations & Celebrations! Journey I had no idea where it would take me. As a teenager my dreams of playing in Hard Rock and Heavy Metal bands came true how cool is that? After I got tired of playing in rock bands I decided on a more personal approach to music. Composing electronic music under the name Oblivious Solitude. Later I was performing and recording with Heather Lind as Stares to Nowhere. I’ve also performed with Mike Hunter as Mayakara, as well as recording and performing solo acoustic music, sometimes modifying and creating new instruments to take the music to new places. to stay strictly within the confines of the traditional course of study. Having achieved early success in competitions both at home and abroad she quickly began to experiment with other forms of music as well as other instruments. Working with renowned cellists such as Janos Starker and Aldo Parisot, with whom she began a graduate level course of study at the age of 18 at the Yale School of Music, did not keep her from playing lead guitar in rock and experimental bands or writing music for electric cello. She feels that musicians who want to consider themselves artists should go beyond mere craftsmanship and constantly look to expand the repertoire of their instrument, fulfilling the needs of the era within which they actively participate. When not performing her own pieces, Shannon focuses on 20th century and contemporary works and has enjoyed working with composers Ezra Laderman, David Lang, percussionist/composer Andy Akiho and tours occasionally with Eric Genuis. Having completed her studies she is currently supporting her first album with shows around the United States and hopes to meet other artists with similar interests whose focus is continuing to stretch the boundaries of virtuosic classical music by embracing technologies which she feels are underutilized. Shannon also shares her parent’s passion for sustainable living and alternative energy and spends as much time as she can at the family’s off the grid organic vegetable farm. uses the vocabulary of classical Indian dance to explore new spaces of artistic expression. Instead of diminishing the foundation of our classical styles, we look to investigate their communicative potential when merged with Western dance traditions. Using Odissi, Kathak, Bharatanatyam, Capoeira, Flamenco, Modern and Ballet training, our dancers collaboratively converse with movement and create dialogue with expression. We are driven by creativity, human emotions, and a desire to be released from the four walls of our daily existence. Our movement vocabulary is a collective effort that aims to create a reachable area for all people to participate and communicate. Artistic Director, Malabika Guha presents the piece “The Love That Remains”. Based on the Portuguese word “saudades,” this piece explores the fervent state of longing by channeling the painful sweetness of remembering a loved one from whom we have been separated while reveling in the joy that they may return (see link above for more info). discipline. She loves using natural or recycled materials in most of her Jewelry, Visual & Fashion Art with inspiration coming from life cycles, family, culture, spirits, friends, dreams, the earth & sky. is dedicated to helping people implement and maintain a healthy lifestyle. By providing information about different kinds of exercise and diet we design a program to meet each individual’s specific needs. We draw on the wisdom and practices of both ancient and modern traditions. East & West Come Together To Maximize Health & Well-being. Philadelphia, Plum is a multi-talented thespian, dancer, martial artist, instructor, poetess and writer who has been involved with performing arts since childhood. She is known for her poetic style, vocal performance, fire dance, flow arts and choreographic flair throughout Philadelphia and abroad. Over the past 15 years, she as toured not only as a solo artist but also as founding member/core performer/assistant artistic director with groups like Archedream & Be Tru Dance Crew among many others. She has also independently released 2 albums of original work with the project Plum Dragoness & the Elements, known for its fusion of multi-media, live world beat musical infusions & spoken word vocals & lyrical poetry. Currently, she’s in collaboration with a music project known as the trio, The Femme-mynistiques. 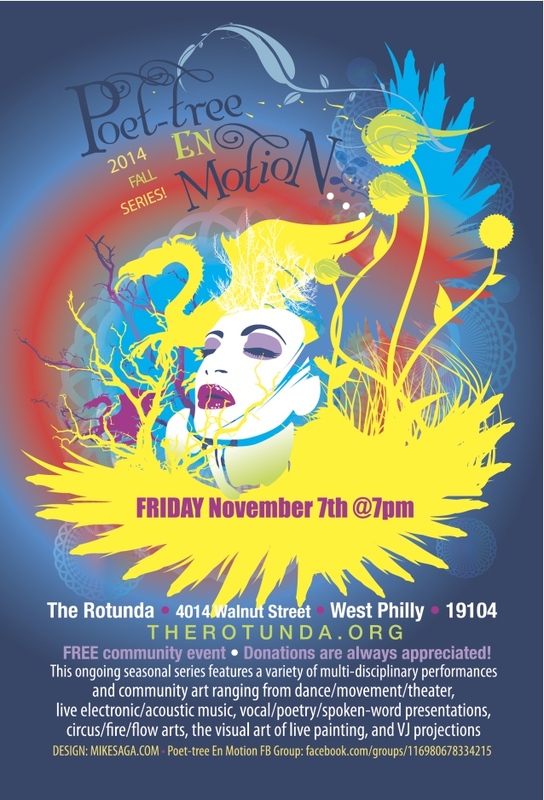 Since 2007, she’s been a resident performance artist & organizer for this ongoing community arts series @ The Rotunda known as Poet-tree En Motion. instruments such as djimbe, guitar, bass, piano, drums, and more. His range of vocal interpretation covers singing, emceeing, beat boxing, scatting, and performing poetry. Text Rich’s musical background started with Hip Hop music as it developed through the 80’s and 90’s and once introduced to the guitar he took to learning blues, jazz, rock, and funk. He brings all these elements of music and expression to the stage, to classrooms where he teaches music, and in the community as a known griot/troubadour openly sharing musical inspirations with others. Known well in the community as Ali Richardson, Text enjoys spending a large portion of his time creating musical learning experiences for all ages. He is also committed to providing quality educational experiences for youth through workshops and classroom education. Philadelphia based VJ that enhances a multimedia experience for various events and has worked with such acts as Axwell, Laidback Luke, Headhunters and Steve Aoki. March 2nd & 8th: Community Outreach Workshops! April 2nd: Spring Rites & Femme-mynistique Fundraising Plights! June 4th: Summer Festivities & Plum Dragoness Fundraising Activities! Join the Facebook Group for Poet-tree En Motion (facebook.com/groups/116980678334215)! This entry was posted in Uncategorized on January 20, 2014 by plumdragoness. This entry was posted in Uncategorized on December 22, 2013 by plumdragoness.